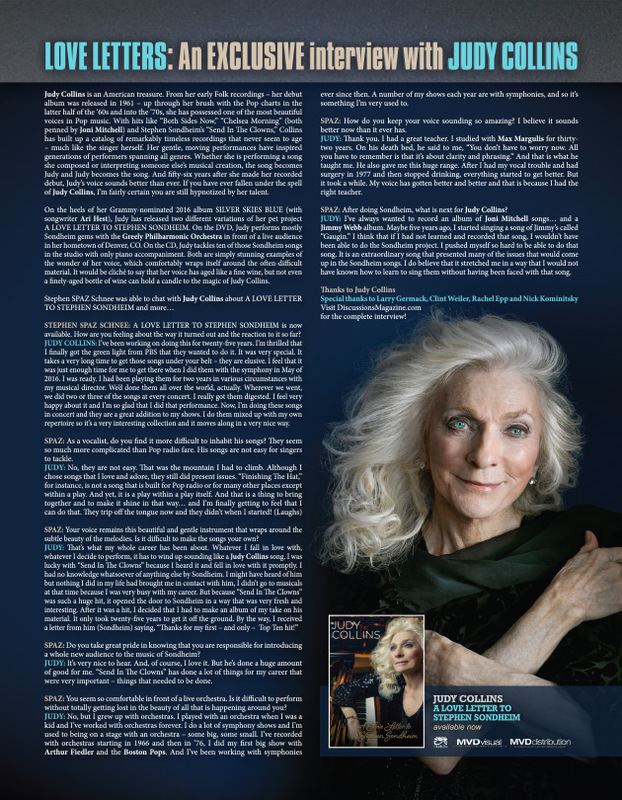 Discussions Magazine Music Blog: JUDY COLLINS: An EXCLUSIVE interview! JUDY COLLINS: An EXCLUSIVE interview! 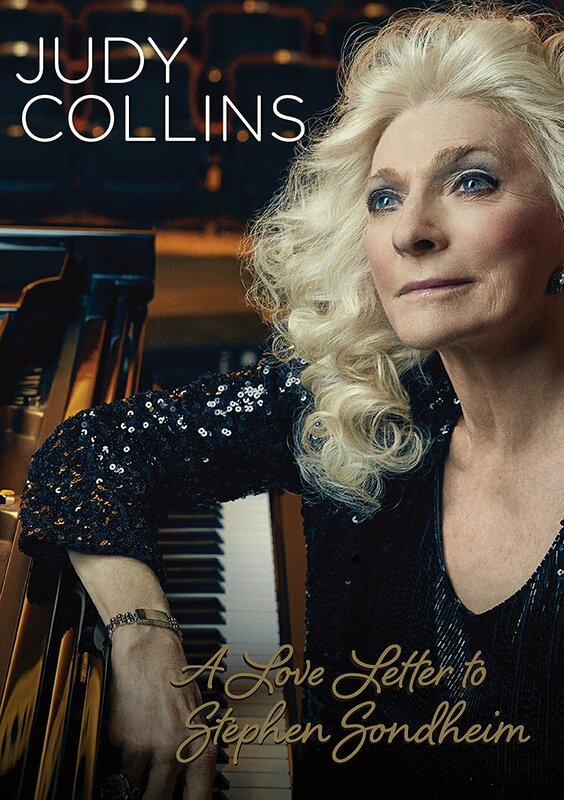 Judy Collins is an American treasure. From her early Folk recordings – her debut album was released in 1961 – up through her brush with the Pop charts in the latter half of the ‘60s and into the ‘70s, she has possessed one of the most beautiful voices in Pop music. With hits like “Both Sides Now,” “Chelsea Morning” (both penned by Joni Mitchell) and Stephen Sondheim’s “Send In The Clowns,” Collins has built up a catalog of remarkably timeless recordings that never seem to age – much like the singer herself. Her gentle, moving performances have inspired generations of performers spanning all genres. Whether she is performing a song she composed or interpreting someone else’s musical creation, the song becomes Judy and Judy becomes the song. And fifty-six years after she made her recorded debut, Judy’s voice sounds better than ever. 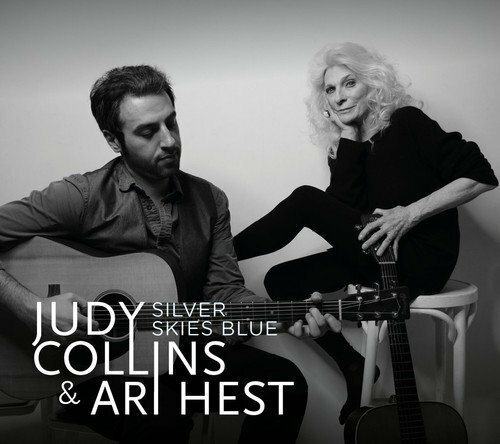 If you have ever fallen under the spell of Judy Collins, I’m fairly certain you are still hypnotized by her talent. On the heels of her Grammy-nominated 2016 album SILVER SKIES BLUE (with songwriter Ari Hest), Judy has released two different variations of her pet project A LOVE LETTER TO STEPHEN SONDHEIM. 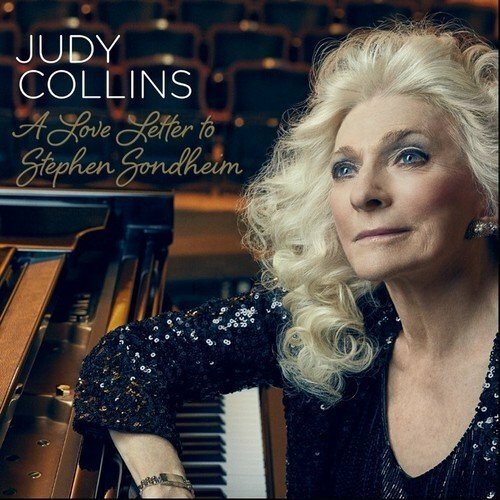 On the DVD, Judy performs mostly Sondheim gems with the Greely Philharmonic Orchestra in front of a live audience in her hometown of Denver, CO. On the CD, Judy tackles ten of those Sondheim songs in the studio with only piano accompaniment. Both are simply stunning examples of the wonder of her voice, which comfortably wraps itself around the often-difficult material. It would be cliché to say that her voice has aged like a fine wine, but not even a finely-aged bottle of wine can hold a candle to the magic of Judy Collins. STEPHEN SPAZ SCHNEE: A LOVE LETTER TO STEPHEN SONDHEIM is now available. How are you feeling about the way it turned out and the reaction to it so far? 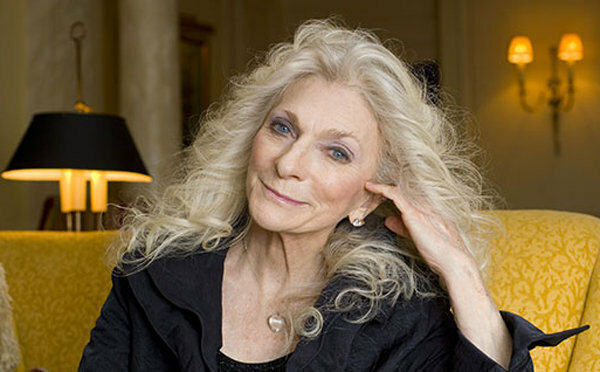 JUDY COLLINS: I’ve been working on doing this for twenty-five years. I’m thrilled that I finally got the green light from PBS that they wanted to do it. It was very special. It takes a very long time to get those songs under your belt – they are elusive. I feel that it was just enough time for me to get there when I did them with the symphony in May of 2016. I was ready. I had been playing them for two years in various circumstances with my musical director. We’d done them all over the world, actually. Wherever we went, we did two or three of the songs at every concert. I really got them digested. I feel very happy about it and I’m so glad that I did that performance. Now, I’m doing these songs in concert and they are a great addition to my shows. I do them mixed up with my own repertoire so it’s a very interesting collection and it moves along in a very nice way. SPAZ: As a vocalist, do you find it more difficult to inhabit his songs? They seem so much more complicated than Pop radio fare. His songs are not easy for singers to tackle. SPAZ: Your voice remains this beautiful and gentle instrument that wraps around the subtle beauty of the melodies. Is it difficult to make the songs your own? SPAZ: Do you take great pride in knowing that you are responsible for introducing a whole new audience to the music of Sondheim? JUDY: It’s very nice to hear. And, of course, I love it. But he’s done a huge amount of good for me. “Send In The Clowns” has done a lot of things for my career that were very important – things that needed to be done. SPAZ: You seem so comfortable in front of a live orchestra. Is it difficult to perform without totally getting lost in the beauty of all that is happening around you? JUDY: No, but I grew up with orchestras. I played with an orchestra when I was a kid and I’ve worked with orchestras forever. I do a lot of symphony shows and I’m used to being on a stage with an orchestra – some big, some small. I’ve recorded with orchestras starting in 1966 and then in ’76, I did my first big show with Arthur Fiedler and the Boston Pops. And I’ve been working with symphonies ever since then. A number of my shows each year are with symphonies, and so it’s something I’m very used to. SPAZ: How do you keep your voice sounding so amazing? I believe it sounds better now than it ever has. JUDY: Thank you. I had a great teacher. I studied with Max Margulis for thirty-two years. On his death bed, he said to me, “You don’t have to worry now. All you have to remember is that it’s about clarity and phrasing.” And that is what he taught me. He also gave me this huge range. After I had my vocal trouble and had surgery in 1977 and then stopped drinking, everything started to get better. But it took a while. My voice has gotten better and better and that is because I had the right teacher. 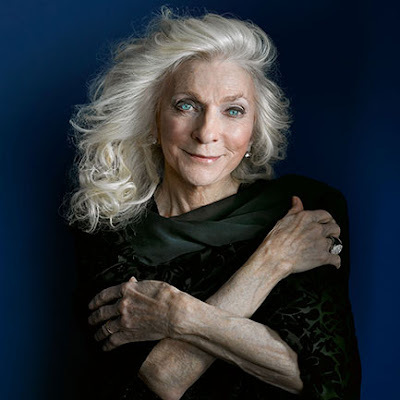 SPAZ: After doing Sondheim, what is next for Judy Collins? JUDY: I’ve always wanted to record an album of Joni Mitchell songs… and a Jimmy Webb album. Maybe five years ago, I started singing a song of Jimmy’s called “Gaugin.” I think that if I had not learned and recorded that song, I wouldn’t have been able to do the Sondheim project. I pushed myself so hard to be able to do that song. It is an extraordinary song that presented many of the issues that would come up in the Sondheim songs. I do believe that it stretched me in a way that I would not have known how to learn to sing them without having been faced with that song. SPAZ: I know that you have written many of your own songs but how was it writing with Ari Hest for the (Grammy-nominated) SILVER SKIES BLUE album? JUDY: It was so great. We had the best time. It really opened doors for me in terms of my own writing. It got me back into it. Working with Ari was very educational and fun. I’ve already started writing songs for my next album and Ari is going to produce. I think he’s so smart and I’m right in sync with what he does.